Update: Do you want to get started with Moodle? Back in 2012 I wrote the article, Do you want to get started with Moodle? which turned out to be one of the most read and most cited articles on this blog. A lot has happened with software and web tools in the following two years so I’ve decided to write an update to it. I’ll be featuring a free and open source localhost server and web app installers from BitNami. For the record, I have no affiliation with BitNami or anyone from BitNami and have had no contact with them about writing this article. Why run Moodle on your computer? An easy way to try out and learn to use Moodle for free without making any commitments, renting servers, etc. A safe sandbox where you can try things out before putting them out on the world wide web. An offline environment where you can create, develop and test learning activities, resources, and courses in private before uploading them onto a public server. Moodle pages will load faster, shortening the time it takes to develop activities, resources, and courses. Install, test, and make sure that 3rd party Moodle plugins and services work as expected and meet your specific needs on your computer rather than on a public server. Since I wrote the original article, I’ve run into some technical difficulties with more recent versions of the localhost server (Wampserver) software I originally recommended, especially for running more recent versions of Moodle, e.g. 2.5 and 2.6. In my search for solutions I came across a number of other developers and Moodle users that were having similar issues. The solutions were far from simple or easy to resolve and so I thought it would be a good idea to find something simpler, easier, and less problematic to run Moodle on your local computer. The first and simplest is the all-in-one Moodle installer (-AMP stack + Moodle), which is available on Linux, Windows, and Mac. Download the appropriate one for your operating system, run it, and follow the onscreen instructions. Important! When you have completed the installation process and you have your Moodle installation up and running and you are logged in, edit your user profile, change your user name and password, and write them down. If you don’t, you can end up getting locked out of your Moodle when you log out and have to uninstall and go through the installation process again. Important! Again, as with the stand-alone Moodle installer, when you have completed the installation process and you have your Moodle installation up and running, and you’re logged in, edit your user profile, change your user name and password, and write them down. Here’s how you can make your face to face lessons more inclusive and interactive quickly and simply by using a chat session during class, and open up a range of benefits that aren’t immediately apparent. Before a face to face lesson or lecture begins, the tutor/teacher/TA opens or schedules a chat room in the course on the school’s, organisation’s, college’s, university’s, or institution’s Moodle*. All the class participants login and join the chat session. They can use their laptops, netbooks, or mobile devices. Now everyone can submit questions, requests, and comments and everyone can see each others’ during the lesson or lecture. *Or any chat client on an elearning platform that has appropriate user management, privacy, and oversight facilities (e.g. most commercial chat services such as Facebook, Google+ don’t allow right of audit, which is necessary addressing ethical and behavioural issues), and that admins, teachers, TAs, and learners can access transcripts of previous sessions for learning and professional development (PD) purposes. How does this affect the classroom dynamic? All learners, even in a relatively large class, have the opportunity to participate in significant and meaningful ways. Learners don’t have to raise their hands to interrupt the flow of the class just to have their question, request, or comment expressed and considered. Less gregarious learners don’t have to compete for attention/get noticed and can therefore contribute their questions, requests, or comments more easily; everyone has an equal voice. Learners can see their peers’ questions, requests, or comments whether they are addressed/focused on or not in the lesson. Teachers/tutors can choose which questions, requests, and comments, in what order, and when to address/focus on. The transcript of the chat session is an invaluable record of what actually happened and when during the class, making it an excellent resource for critical reflection. Teachers/tutors can review the transcript to see where the lesson could be improved and/or consider alternatives. Teachers/tutors can see who’s participating more or less than they should be and find out why. Teachers/tutors can assess learners based on their participation both quantitively and qualitatively even if it didn’t get addressed/focused on in class. There’s a record of questions, requests, and comments that it may not have been appropriate to address/focus on during the lesson but could provide productive avenues of inquiry in subsequent classes. Could it also get learners off of Facebook during class? When installed and activated, it will automatically analyse texts using one of the chosen readability formulas and print a small, discreet box at the top right of the analysed text, displaying the results. Moodle’s text filters apply to all text areas and so learning content and user generated texts will have their readability level/index displayed, for example in Pages, Books, Forums, Wikis, Glossaries, Assignments, Databases, Lessons, and Labels. I’m interested in hearing any comments and suggestions you might have for possible uses, advantages, and/or limitations of this plugin. 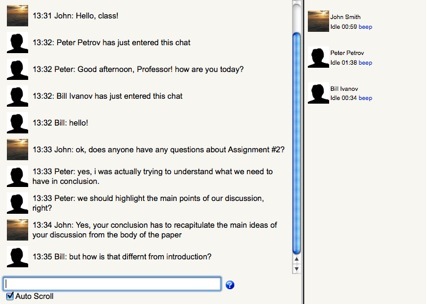 I’d also like to keep the discussion as widely accessible as possible to all members of the Moodle community. To that end, rather than post comments here (comments are now disabled on this blog) please participate the Moodle.org discussion thread for this plugin: https://moodle.org/mod/forum/discuss.php?d=243715. It’s free and easy to join, it’s well moderated, and you’ll be in contact with thousands of other Moodlers. The beta version of the plugin (still under development) is here. At the moment, I don’t recommend it for production sites as it hasn’t been extensively tested. This is a quick update anouncement for the SWF Activity Module for Moodle 1.9. It fixes some issues that some users were experiencing with sending grades to Moodle’s grade book and some other functions. You can find the latest version released today on the project downloads page at Google Code. PHP 5.3 and above are becoming more widely used on servers that are hosting Moodle. Some of the old legacy core Moodle code contains functions that are deprecated in PHP 5.3 (some 400 or so instances of code) and are unlikely to be fixed. These deprecated functions trigger PHP to generate deprecation warnings, which in Moodle sometimes returns unexpected results that were interfering with the SWF Activity Module AMFPHP service classes. The result was that sometimes, grades weren’t being sent to Moodle’s grade book, and snapshot images from the Avatar camera and Concept Map MILAs weren’t being saved. It was an intermittent bug and difficult to track down but now, hopefully, everything should work for everyone all the time. You can see some demos of the SWF Activity Module used to deploy Multimedia Interactive Learning Applications (MILAs) on the MILAs demo course on my R&D Moodle. You can login as a guest so no Moodle account is required. On a related topic, I’m nearing completion of a beta testing version of the SWF Activity Module for Moodle 2.5+. Please stay tuned for updates in the near future. You can subscribe to posts from this blog by clicking on the tab on the bottom right of this page.